Whether you are at the craft store, grocery store or watching HSN, one thing that you will see (most definitely) is coloring books! Coloring books for adults was one of the hottest trends this year and it doesn't seem to be going away. It seems like every time you turn around there is a new coloring book or coloring book/colored pencil set being sold. Now personally, I love coloring! However, I don't believe that your coloring book pages (that you spent so many hours on) should be hidden away! With that being said, you could display your coloring book pages in pretty picture frames and call it a day. 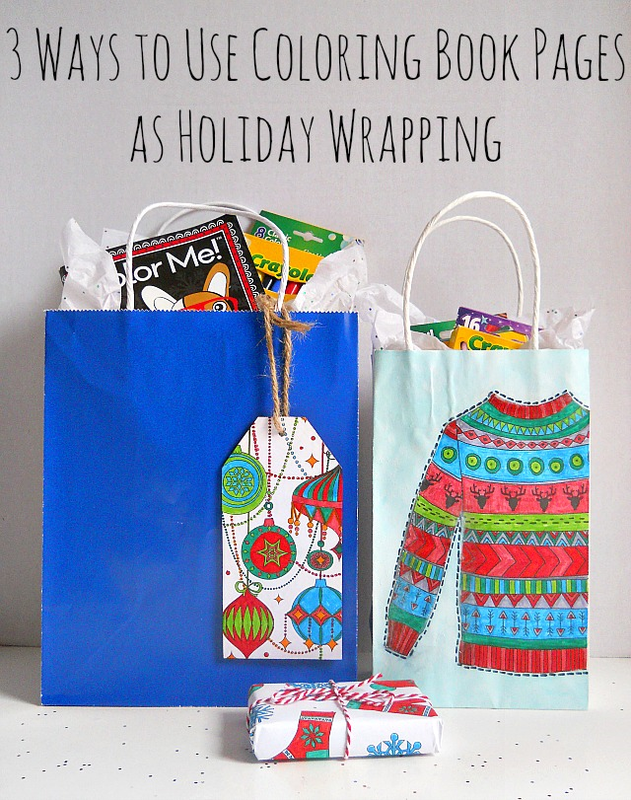 There is nothing wrong with that, but why not incorporate those coloring book pages into your holiday wrapping! I mean, we are in the season of giving! Why not give a wonderful gift, wrapped in a wonderful semi- handmade package! So today I'm going to share with you three simple ways on how you can incorporate your coloring book pages, into your holiday wrapping! Most of time these adult coloring books include pages which are intricate patterns. These intricate patterns (when cropped or cut down to a certain size) make great designs for gift tags! Now you can buy wooden gift tags or paper gift tags at your local craft store. 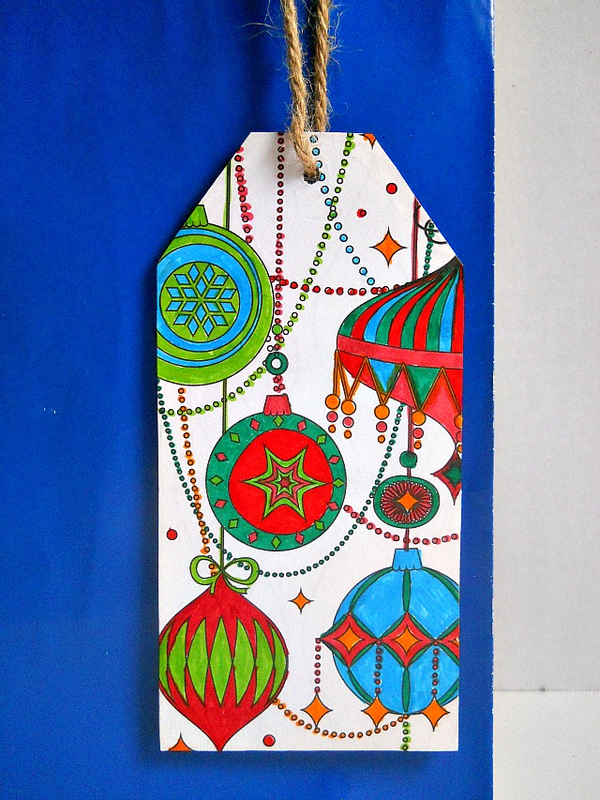 Above I used a jumbo size wooden gift tag, to capture more of the coloring book page. However, you could buy any size gift tag you like. 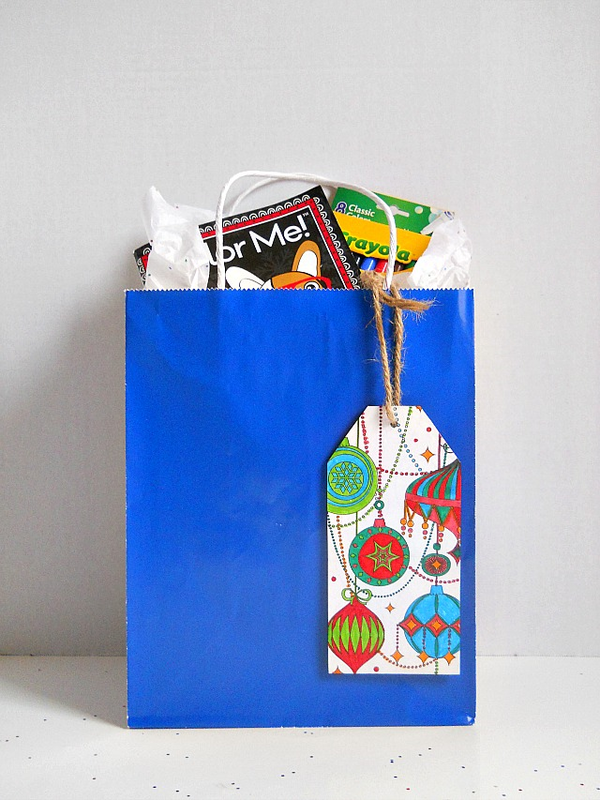 Cut out your coloring book page to fit the size of your gift tag. Apply some scrapbook adhesive to the back of your coloring book page and adhere it to your gift tag. This project is easy peasy lemon squeezy and adds that little punch to a plain old gift bag! 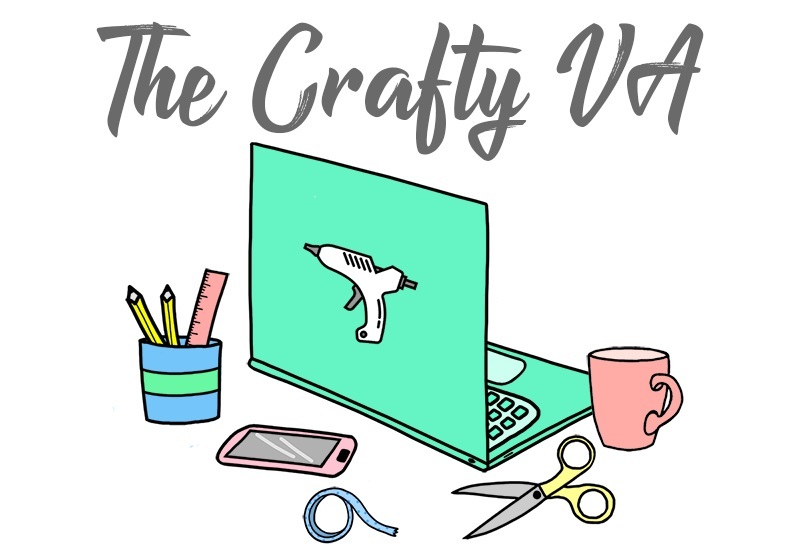 If your partial to cutting up a whole coloring book page that you worked so hard on, then incorporating the whole page (instead of a small portion) maybe more for you! 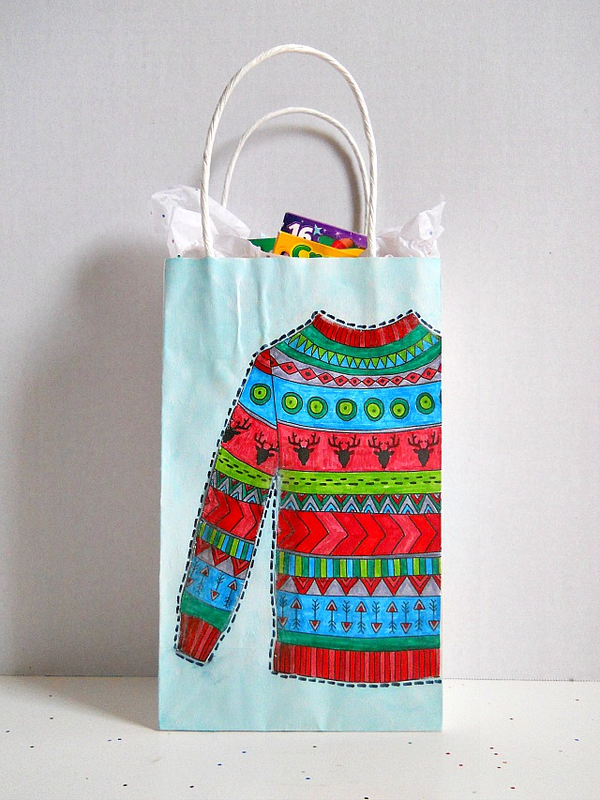 For the above bag, I used a coloring book page which was half of a sweater (I mean, literally the coloring book only gave me half of a sweater to color). Anyway, I cut out the sweater and glued it on top my gift bag. Then I took a black marker and made dash lines around the entire image. Now I will say, that a project like this is a bit more time consuming. However, the overall look is one unique bag which you won't find at any store! 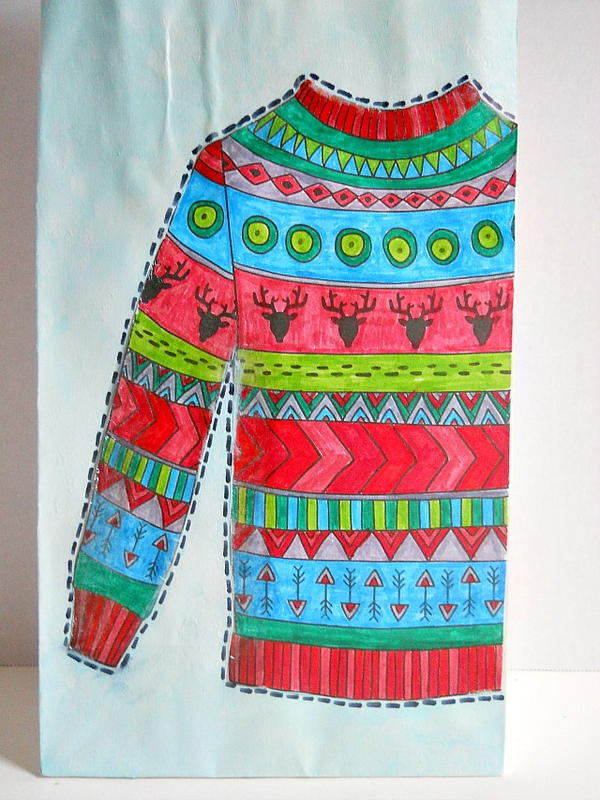 This last idea is really self-explanatory, but if your short on wrapping paper, don't rule out those coloring book pages! 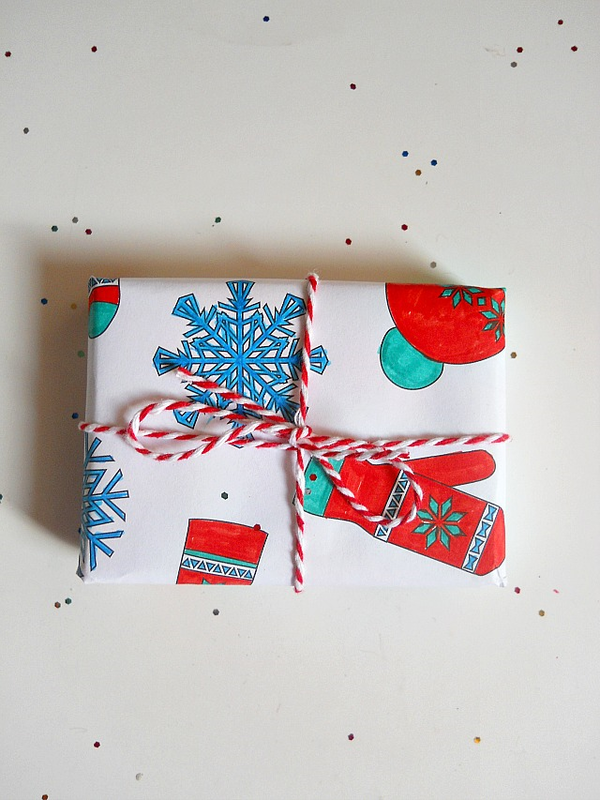 Simply wrap a gift the same way you usually would, but just with a coloring book page. This idea would be perfect for those smaller gifts, that you may want to add something a little extra too! Those are my three simple ways on how you can incorporate coloring book pages into you holiday wrapping! Now something to keep in mind, when creating projects 1 and 2, is that you should not use Mod Podge as a glue if you've been coloring with markers. If you do, then your markers on your coloring book page will bleed (and we don't want that)! Instead use a scrapbook adhesive or glue stick. Are you into coloring? or Are new coloring supplies on your Christmas list this year? 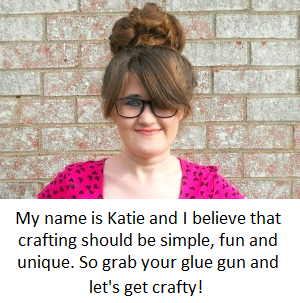 p.s Today is the last day that you can enter the Mini Holiday Craft Giveaway! 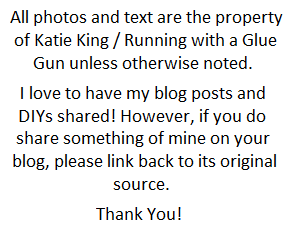 If you want to win some awesome prizes then click here!